Bringing with them the close of FY 2012, September budget figures were encouraging. The deficit fell to just under $1.1 trillion, thanks to increased revenues—up 6.4% from the prior fiscal year—and a reduction in spending—down 1.7% from the previous fiscal year. These numbers reinforce the trend we have seen since the current recovery began: spending growth has been minimal, but revenues have continued to expand as the economy has grown and jobs have increased. The above chart shows the 12-mo. 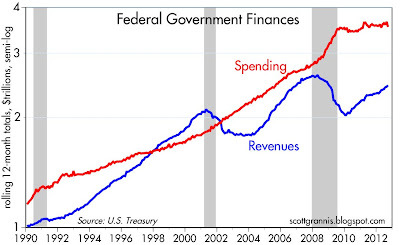 rolling sum of federal spending and revenues. 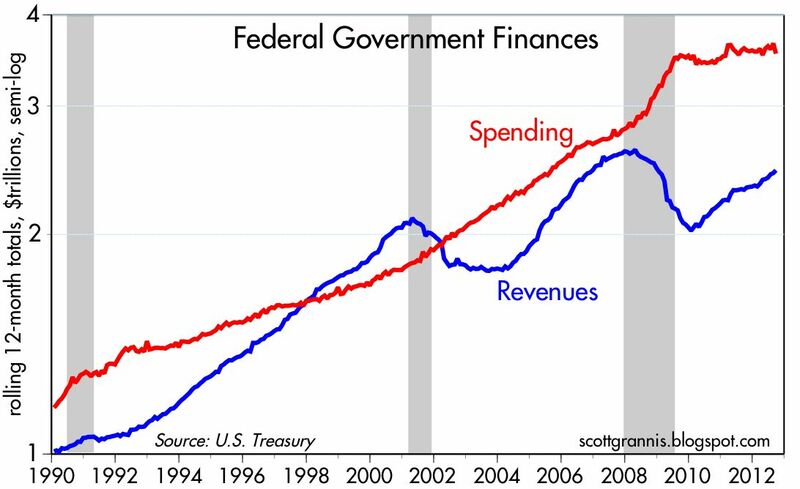 Note that spending is almost unchanged since the recession ended, whereas revenues have risen significantly, and without the help of any tax hike. In fact, revenues have increased despite tax rate decreases, since there has been a partial payroll tax (FICA) holiday in effect for most of the past two years. This next chart shows the same numbers as the first, only relative to GDP. Here we seen a welcome decline in spending, and only a meager increase in revenues. 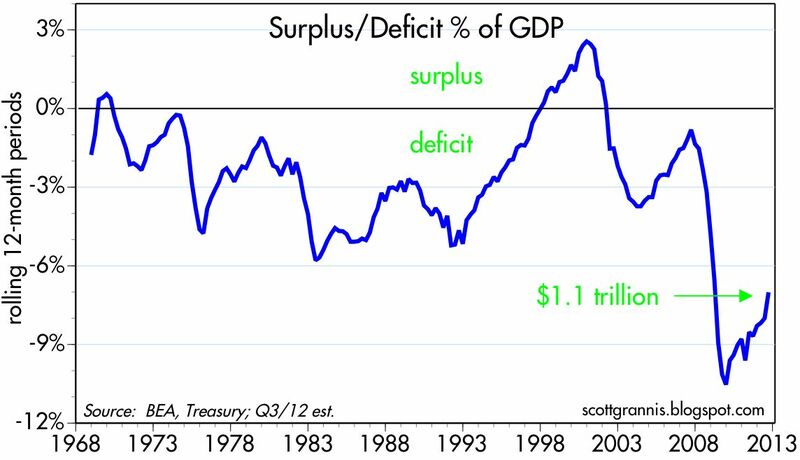 The federal deficit as a % of GDP has declined significantly from its 10.5% high in late 2009 to what is now about 7%. 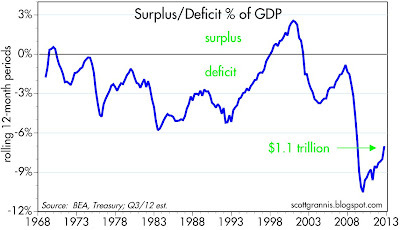 This is very good news, since deficits above 9% of GDP can quickly become destabilizing. If these trends continue, the deficit will continue to decline without any need for higher taxes. The sad part of the story is that the federal deficit, which has totaled almost $5 trillion since the end of 2008, has effectively absorbed almost all of the after-tax profits (which have set all-time records) of U.S. corporations over the same period. Corporations have worked extremely hard to be productive and profitable, only to have the fruits of their labors in large part squandered by profligate government spending, which for the most part consisted of transfer payments (not to mention countless billions lavished on "green" industries that have since gone bankrupt). This is the simplest answer to the question: "why has this recovery been so weak?" If the fruits of the economy's labors are not spent and invested wisely, there is little reason to expect living standards to rise. In this light, the reduction in the burden of government in recent years is a welcome development. The sum of what has happened is hugely disappointing, but the change on the margin is positive. 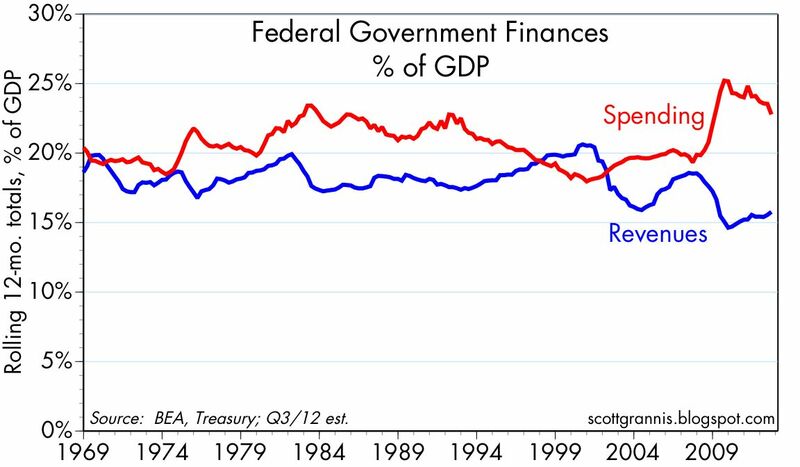 I wish people would note that federal spending, as a percent of GDP, had nearly reached the low level of 15 percent, before Bush jr became president. Bush ramped up federal spending, especially on defense. To me, 1999 says we can get federal spending down to 15 percent of GDP without much sacrifice. It will take serious re-thinking our of $1 trillion a year parasitic defense-homeland security-VA complex, and higher retirement ages on Social Security, but it can be done while enhancing prosperity. Sadly Romney wants to hike defense spending, and probably will get hysterical about security too, while Obama wants more social spending. 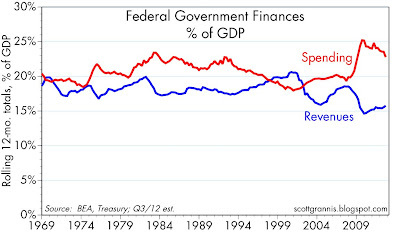 Federal spending prior to Bush II hit a low of 18%. are you joking? the gap between spending and revenues is still way too wide and you're practically celebrating! what, because they've backed off from suicide then cutting off your arm looks good? "why has this recovery been so weak"
2. Real private residential fixed investment. Lavished on 'green' industries. Are you kidding me? It's amazing how the far right focuses on a few billion when in reality their pork projects and defense spending total trillions over the decades. In addition, the Federal Reserve subsidization of the financial sector extracts trillions from our future retirement and savings accounts. Don't miss the forest as you travel through because the trees are definitely getting in your way. Let's add all the pork spending and the Fed distortions to the list. That's fine with me, since two or three wrongs don't make a right. I mention the green subsidies because those are relatively new; the others have been going on for a long time, unfortunately. Romney is surging in the polls. Obama's going down. So why isn't Wall Street celebrating? So why isn't the stock market going up? How about a graph of deficit divided by revenues? Our pols in DC are now spending about 45% more than they are taking in. Try doing that for 10 years at home. They have no discipline. Even in the past with 2.5% of GDP deficits they were spending about 15% every year than we were taking in. Scott! I love your blog. It's great, it's factbased. Lots of graphs to visualize your points. Less hot air, more facts and numbers. This is why I read the best econblogs. I don't want the political commentary. Now, that being said, I wonder what your estimates are for gross U.S. debt in 2015 and net U.S. debt in 2015. The reason I ask is because the CBO is lowballing it by about 10 percentage points lower than the recent IMF World Economic Outlook report released now in October. Their(the IMF's) calculations shows that net U.S. debt will reach almost 90 %(89.7% or thereabout) by 2015 while the CBO estimates it will "only" get to about 80%. And even today, the IMF estimates net U.S. debt to be above 80%. The numbers I talk about can be found on page 202 inside the document(your pdf reader may display it as "222" since there is about 20 pages before "page 1" starts in the document. So try either page 202 or page 222 to find it). And if you do/don't, what is your own? I don't pretend to understand these leading indicators nor how they do not jibe with the OEDC leading indicators which have been falling. What will happen to their RECESSION PREDICTION?? A measure of future U.S. economic expansion pushed higher last week, while the annualized growth rate rose to its loftiest level in more than a year - 5.7%. The index's annualized growth rate accelerated to its highest level since May 2011 at 5.7 percent, from 4.6 percent. U.S. inflationary pressures were higher in September, as the U.S. future inflation gauge climbed to 103.4 from an upwardly revised 101.0 in August....according to data released Friday morning by the Economic Cycle Research Institute. "The USFIG jumped in September to an 18-month high," ECRI Chief Operations Officer Lakshman Achuthan said.... "Thus, U.S. inflation pressures have moved up a notch." Emil: Re debt projections. Forecasting what the federal debt/GDP ratio will be three years from now involves making a series of assumptions (e.g., revenue growth, spending growth, real GDP growth, inflation), all of which are somewhat independent variables. The chance of the result being meaningful is very low, thus it is an exercise in guesswork. If the economy picks up and spending is kept somewhat in check, the net debt/GDP ratio will decline, and it could decline meaningfully from its current level of about 70%. I can't be more specific than that. Somewhere a CA consumer is crying while pumping gas. Remembers fondly Scott's multiple posts on NatGas.